This handsome accessory goes from jaunty cane to posh pinstripe umbrella with a flick of your wrist. For the man about town, it's essential to cultivate an air of sophistication, exude confidence, and make looking positively dapper seem absolutely effortless. 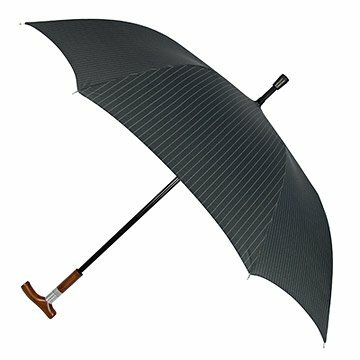 Maintain your composure rain or shine with this handsome accessory that goes from a posh pin-stripe umbrella to a jaunty cane with a flick of your wrist. The umbrella's spacious arc can accommodate two shelter seekers, letting you turn on those irresistible, gentlemanly charms in fair or foul weather. Made in China. The boy problem I have with the umbrella is that the cane is a bit shaky when using it as the umbrella but as a cane itself, works just fine.